The Prophet’s safeguarding the purity of Tawheed and closing every avenue that leads to polytheism: Kitābut-Tawheed, Ch. 22. 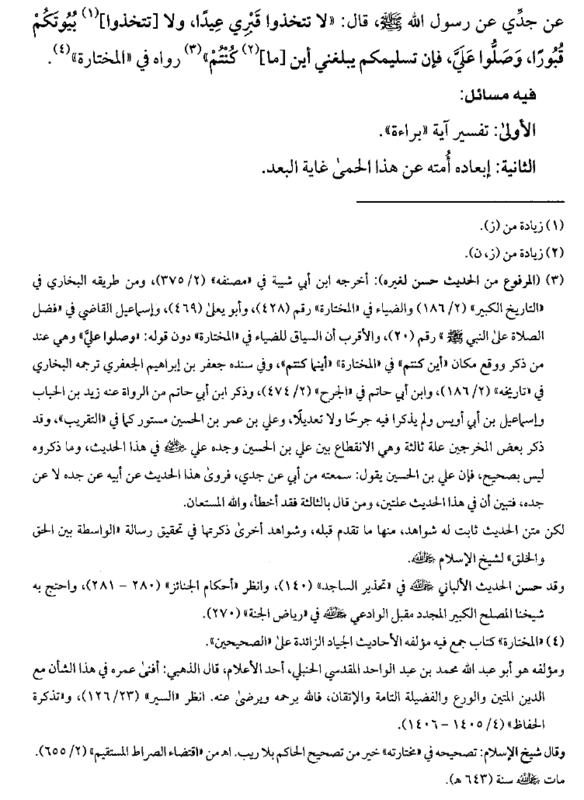 It is an explanation of Kitāb at-Tawheed of Shaikhul-Islaam Muhammad b. Abdul-Wahhāb (d. 1206H, rahimahullāh) by ash-Shaikh al-Allāmah Ahmad b. Yahyā an-Najmee (rahimahullāh). 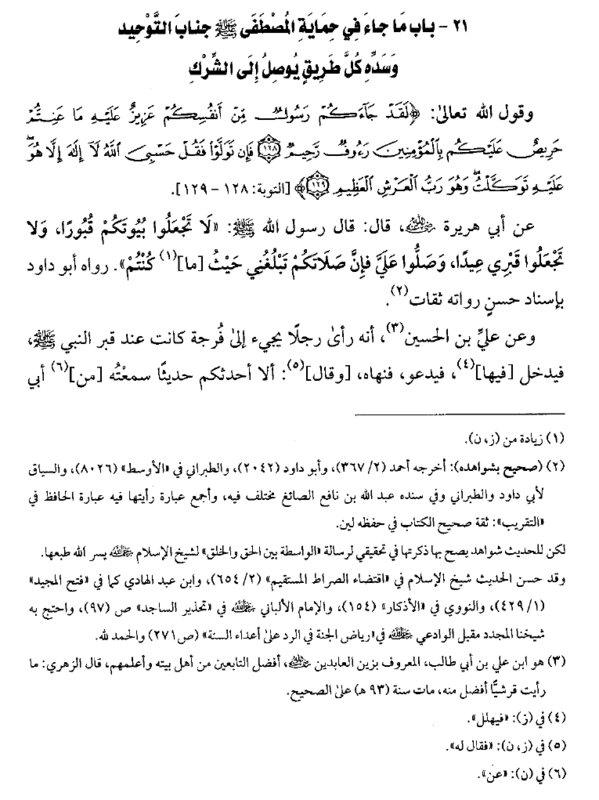 Chapter 22: That which has been narrated concerning the Chosen Prophet’s safeguarding the purity of Tawhīd and closing every avenue that leads to polytheism (shirk). From his warnings also, is: When a man came to him and said: “O Allah’s Messenger! The people are exhausted and facing hardships, their families are suffering, their wealth is destroyed, their cattle has died – so seek from Allah rain for us for verily we seek your intercession with Allah. And we seek Allah’s intercession with you.” He replied: “Woe to you!! Do you know what you’re saying? !” The Messenger (ﷺ) glorified Allah, and he did not cease doing so until the effect of that was seen of the faces of his Companions, then he said: “Woe to you! Allah is not to be sought as an intercessor with any of his creation! Allah is greater than that. Woe to you! Do you know who Allah is?! His Throne is over the heavens like this – and he gestured with his fingers like a dome above him – and it creaks on account of Him as a saddle creaks on account of its rider.” [Abu Dawood (4726), declared weak by Al-Albānee]. There is around his grave a triangular wall so that no one is able to stand at his grave and face the Qiblah so that there may be between him and the Qiblah the grave. 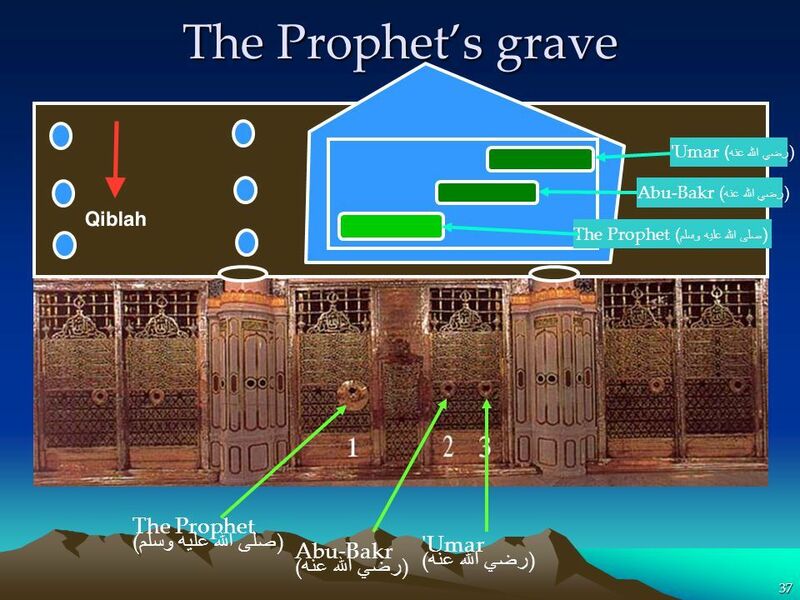 And it is surrounded by a grill or lattice work that prevents entry into the room – and it is the room of A’ishah wherein the Prophet (ﷺ) is buried, and likewise Abu and ‘Umar (radiyallāhu ‘anhumā). “It grieves him…” due to him not being pleased at all, “that you receive injury…” i.e. that which hurts you. “He is anxious over you” meaning that he is eager that you receive what benefits you. There occurs in a hadeeth from the Prophet (ﷺ) that he said: “My similitude with you is like a man who built a fire,” meaning is the darkness of the night, “so the moths and flies started flying into it, so he waves them away from it. And I myself am trying to hold you back from the fire by your garments, but you are slipping through my hands.” [Reported by Muslim (2285), Bukhāree (3426). 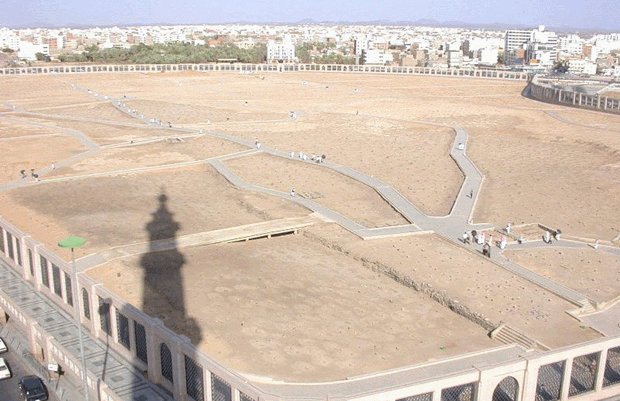 Baqī’ graveyard in Madinah. It is forbidden to pray in graveyards or turn them into places of ritual gatherings or celebrations. In the hadeeth of Abu Hurayrah (radiyallāhu ‘anhu) the Prophet (ﷺ) commanded his Ummah not to turn their homes into graves because it is graveyards wherein prayers are not performed, and Qur’ān is not recited therein. So it is necessary that people do pray in their homes, and recite the Qur’an in their homes too. Then the Prophet (ﷺ) said: “Do not make my grave into a place of ‘eid.” The Prophet forbade that his grave be turned into a place of celebration or rituals. So people go to his grave, and everyone who comes to it, he is telling them not to turn his grave into a place of gathering for rituals and celebrations. Then the author mentioned a narrations from ‘Alee Ibn Al-Husayn (radiyallāhu ‘anhu) that he saw a man coming to a gap that was next to the grave of the Prophet (ﷺ), so he entered it and and started supplicating. So ‘Alee Ibn Husayn prohibited him from that, and told him: “Shall I not relay to you a hadeeth that I heard from my father (Al-Husayn Ibn ‘Alee), from my grandfather (i.e. ‘Alee Ibn Abee Tālib), from the Messenger of Allah (ﷺ) who said: “Do not take my grave as a place of ‘eid (ritual celebration), nor your homes are graves. And send prayers upon me for verily your salutations (tasleem) will be conveyed to me from wherever you are.” It is reported in Al-Mukhtārah. 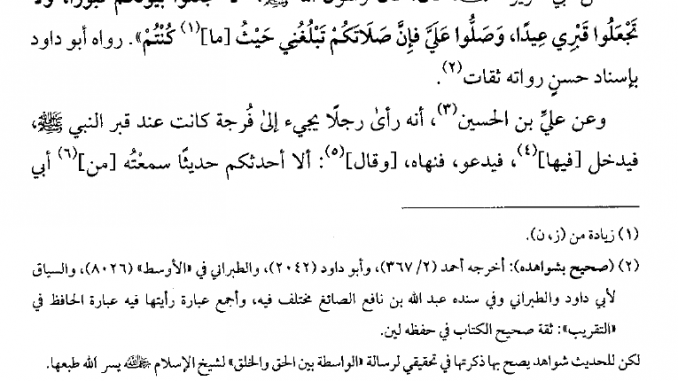 See Al-Qawlus-Sadeed fee Maqāsidit-Tawheed pp. 86-87. I say: How amazing are these tremendous sentences from this intelligent, skillful, and brilliant scholar – so all praise is due to Allah for that.